In late December 1984, Bernhard Goetz shot four alleged muggers on a subway train in New York City. The shooter became known as the "Subway Vigilante" and the case was widely covered in the press, with some connecting it to Death Wish, Michael Winner's 1974 film starring Charles Bronson. In August 1984, I had moved to New York City, but I'd never seen the film, so Bernhard Goetz is who I had principally in mind when I finally caught up with Death Wish some years later in an edited version on television. These memories came flooding back when the the first trailer for Eli Roth's remake starring Bruce Willis dropped last summer, sparking (mostly) outrage and dismay from the public and press, as much against the filmmaker as against the film's presumed themes. I commented at the time: "This bears no resemblance to the tone of the 1974 original, but I've been told that it has some of the same spirit of one or two of the sequels, which steadily became more outlandish and jokey. So I'm intrigued by the Joe Carnahan script, and also by Eli Roth's direction; not ready to dismiss it out of hand." The trailer, and the outraged reactions, prompted me to rewatch the original film, as well as its four (?!) sequels, and to read Brian Garfield's novel, as well as its sequel, Death Sentence, which served as the loose basis for James Wan's same-titled 2007 film. The original novel is excellent, capturing the inner demons that torment accountant Paul Benjamin after his wife is killed by intruders in their apartment on the Upper West Side of Manhattan. His adult daughter, who was raped during the incident, is traumatized and slowly withdraws completely from reality. As his frustration builds, Paul slowly begins to justify to himself why buying a gun and killing criminals in the act is the only reasonable solution. It's terrifying, in large measure because Garfield makes a convincing case for Paul's logic and reasoning, especially in the context of the 1970s, when crime was running rampant in New York City and the authorities seemed powerless to stop it. Paul is devastated, first, and then angered. A colleague has described him as a "bleeding heart liberal," so his personal beliefs are tested when the police tell him there is little they can do without eyewitnesses. A business trip to Arizona gives him a chance to get away and relax in the desert air, but instead he broods. His client, Amos Jainhill (Stuart Margolin) takes him to Old Tucson, a tourist attraction with a gun show that draws Paul's rapt attention. At the end of his trip, Paul is gifted by Amos with a gun, and he knows what he wants to do with it. On his first attempt to use his weapon against a criminal, Paul collapses into a trembling heap. That first act of deadly violence is transformative, however, to an extent that is seldom hinted at in American crime films. And the sight of the macho mighty man Charles Bronson becoming physically, visibly ill, is quite bracing to see. Bronson, building off his memorable supporting turns in The Dirty Dozen and Once Upon a Time in the West, had become a reliable leading man in genre pictures like Cold Sweat, Red Sun, The Valachi Papers and The Mechanic, among others. So I imagine seeing him crumple, even if he was portraying a grieving, ordinary businessman, was somewhat of a surprise to audiences at the time. Perhaps Bronson was feeling the constraints of his box office success. Soon, he would branch out to play an urban writer in St. Ives and a cowboy in the lightly comic From Noon Til Three before retreating to more familiar territory in the 1980s. His later work was not entirely without merit, but the sequels to Death Wish, which began in 1982 with Death Wish II, became increasingly ridiculous, finding Paul / Bronson continuing his vigilante ways, first in Los Angeles, where his maid is gang-raped and killed; his daughter is kidnapped, raped and then leaps to her accidental death; and a NYC detective (Vincent Gardenia) heads to LA in search of Paul, where he ends up in a taxi, slowly chasing a bus (?! ), and then gets shot up in a park. Death Wish 3, shot on an outdoor set in London that posed badly as East New York, was certifiably loony, to the extent that it's a blast to watch, as long as you take nothing serious. The fourth and fifth installments, however, lagged badly in both dramatic tension and Bronson's apparent interest in the proceedings. In the original, though, Bronson's emotions are on full display. He's a man who begins the film as a loving husband and father, and by the halfway point is unsteadily shooting muggers in a vain attempt to 'make a difference,' barely holding it together sufficiently to avoid easy detection by his workmates and the authorities. And the authorities do indeed give chase to the mystery killer, who becomes a media sensation on television, radio and newspapers. Vincent Gardenia, who returned in that ill-fated sequel, represents all of law enforcement as the rather brilliant leader of the investigation, and his blustery performance is entirely convincing. Supporting roles are filled with good actors like Steven Keats (as the son-in-law), William Redfield (as a business associate), and Stephen Elliott (as the police commissioner); while the bit parts are enlivened by people like Jeff Goldblum (in his debut as a nasty freak) and Christopher Guest (as a young police officer). We also get quick glimpses at Paul Dooley, Olympia Dukakis, Al Lewis and Lawrence Hilton-Jacobs in uncredited but recognizable roles. Beginning his directing career in the late 1950s, British helmer Michael Winner moved to Hollywood in 1970 and soon began a fruitful collaboration with Bronson, starting with Chato's Land, followed by The Mechanic, and The Stone Killer before tackling Death Wish. 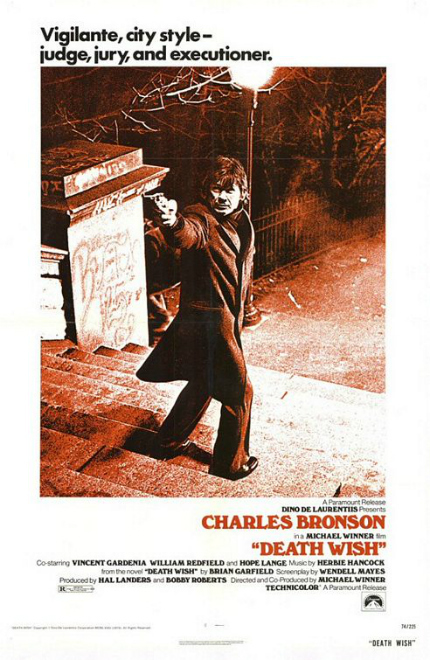 Upon its release in July 1974, one week after another Bronson-starring film, Mr. Majestyk, Death Wish became something of a media sensation itself. It was treated brutally by film critics. Vincent Canby of The New York Times called it "a despicable movie," while Variety noted later: "Poisonous incitement to do-it-yourself law enforcement is the vulgar exploitation hook on which Death Wish is awkwardly hung." Reportedly, it inspired vigilante crimes at the time, and, as noted at the outset, it sparked comparisons ten years later with the New York subway shootings. Revisiting the film last summer, I found I was responding to Bronson as an actor and movie star, and to Winner's skilled-journeyman direction, rather than to the material and/or intended message. I've long loved deadly action films as entertainment and what's wrong with that? Well, in the months that have passed since I first began researching and writing this article, my appetite for action films that revolve around weapons and bloodshed and wanton slaughter has diminished greatly. Now I find myself actively avoiding them. So there's a queasy feeling in my stomach that won't go away whenever I think about this film now. Does Death Wish, then, endorse the idea of vigilante justice? Giving Bronson the benefit of the doubt, his cautionary message, at least in publicity materials of the time, that 'violence begets violence' is certainly evident in the story and, sure, is indisputable in real life too. But the film itself is not so conclusive, leaving it for the viewer to decide what to do. And in a nation filled with firearms, that is a very scary message. 70s Rewind is a column that allows the writer to ruminate on his favorite film decade.